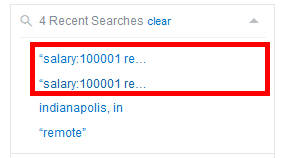 With the recent UI updates to Jobs, the Recent Searches has started truncating search strings, even when there is room left in the box to expand the string. The highlighted search strings are for two different searches. One is looking for only remote positions with a salary over 100K. The other is looking for remote positions, or relocation available positions, with a salary over 100K. With the truncation, it's not possible to tell which is which. Please expand the string to fill the available space. Thanks for reporting this issue. It should be fixed now.